Do You Believe in Anything Worth Contending For: If you avoid trying to expose false belief systems for what they are, it's called "tolerance" and "respect". Taking the path of least resistance has never been so popular because all most people seem to want to do is live a trivial life with a trivial world view, avoid difficulties and unceasingly entertain themselves. The Church... Then and Now The church has drifted so far from the original blueprint, that there is little resemblance between what takes place now, and what took place when James headed up the church in Jerusalem. In fact after studying the New Testament, one can only come to the conclusion that much of the modern church has little or no idea why it exists at all, or what it is meant to do. Much less how the meetings are supposed to be structured and who they are supposed to be led by. Why The Fire Hasn’t Fallen: We are apparently blind to the fact that because we are comfortable, complacent and lack passion (Jesus called it lukewarm) God has withdrawn His presence from us. We want to pack our pews, double our offerings, hear sermons on encouragement, love, leadership, and being the best you can be. We have fund-raisers to build bigger buildings and more 'youth centers', but through it all we never seem to realize that the glory and power of the Lord are conspicuous by their absence. Too many churches have substituted an endless cycle of activity for the Holy Spirit that very effectively covers up the fact that they are spiritually dead as dodos - social clubs with God sprinkled in to legitimize the word 'church'. So what would it take to pray down revival? Knowing God. Is it possible to experience God, without all that theological gobbledy-gook? And why do some Christians seem to experience a much closer intimacy or reverent familiarity with God that is foreign to many of us. Fearing God? Because many teachings and doctrines within our churches today portray God only as all loving, many assume there is no reason to fear Him. They would do well to study Scripture more carefully. Worshiping God.. it is well to be aware that it is entirely possible that you return from church on Sunday morning happy at how much you sang His praises and how good the 'worship' was, blissfully unaware that the Lord turned His face away from you and did not accept your worship. Taking God’s Name In Vain.. When God commanded that His name not be used in vain, are we to understand this to mean YHWH, one of the names of God, or are we to take this to mean any form of God's titles too? Reading And Understanding Your Bible includes 10 steps To Bible Literacy, What Are We Looking For In The Bible? 12 Golden Rules, Never Read A Bible verse, The Use of Commentaries, Sermons on The Bible, Why People Find the Bible Difficult and More. Baptism One would imagine that the simple act of dipping another human being into water would escape the controversies of weightier, or more complicated topics in Scripture. But no! Baptism is one of the most controversial subjects in all of Christendom. Prayer Unanswered Prayer, Ritual Prayer, Persistent Prayer, Praying in The Spirit, Jesus’ Blueprint for Prayer. The Great Commission The greatest obstacle to the Gospel is silence. By remaining silent and hoping that our Christian life will testify for itself we fail to keep the Lord’s commandment.... “go ye into all the world, and preach the Gospel to every creature.” But why is it so hard to say those first few words about the most important Person in my life? Why do I hesitate to pass along the best news I have ever heard? The Christian Woman Women in The Church Several articles on the role of women in the church... Including Women in the Bible, should women teach in church, women’s lib, head covering and modesty. The 10 Lies of Feminism At its inception, the feminist movement, accompanied by the sexual revolution, made a series of enticing, exciting promises to women... supposed to enhance a woman's quality of life and improve her options, as well as her relations with men. Now, a decade or so later, women have had to face the fact that, in many ways, feminism and liberation made promises that could not be delivered. A Woman of Strength Christian women living in a society that offers distorted or inadequate models for women, need an ideal that applies to the circumstances we live in, yet remains fully expressive of God's purpose for women. How Should Christian Women Dress? Too many times, when you see a group of girls standing around, there is very little difference in dress between those who profess to know Christ and those who don’t. Modesty Matters! Fasting has been out of vogue for at least 150 years. In the twentieth century church, the idea seems alien to us. God's Word assumes that fasting will be a regular part of a Christian's life. Yet for most of us, it's not. If we were to make a study of fasting in the Bible most of us would find ourselves very challenged about this neglected area of Christian discipline. What Patterns of Prayer and Worship Can Do What is the fruit of observing patterns of prayer and celebration? Does it lead to a stifling institutionalism or a deeper knowledge of God in Christ? 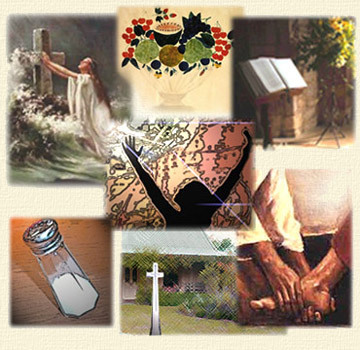 How can observing times and seasons support the life of the Christian family and the life of the Christian community. The Myth of Faith Alone Perhaps one of the all time greatest delusions in the Christian world, is the innumerable number of people who are under the impression that in order to be forgiven their sins and inherit eternal life, all they have to do is believe Jesus died for their sins on the cross. In fact, the suggestion that anything other than faith is required for salvation, is not only militantly opposed by most of Christendom, but denounced as an unbiblical and works based false teaching. But is this true? Holiness There is little or no emphasis on holiness in the modern church buried as it is below flamboyant mega star preachers, worship teams that could find work in many Broadway productions, large "crusades", exciting "revivals" - Glitz and glamour that Hollywood could be proud of. Yet the Bible clearly states that "Without Holiness, No Man Shall See God!" (Hebrews 12:14) which means it behooves us to know exactly how the Scriptures define holiness. Unfortunately, our traditions are often regarded with as much authority as God’s words. The Christian and Knowledge In part, because the two words are widely misunderstood, all too many Christians seem to be under the impression that "theology" and "doctrine" are of minimal importance. The problem is that, whether the average Christian realizes it or not, all Christians are theologians since, based on however much study they have done, they have some knowledge and thoughts about God. And, when it comes to their faith, all Christians believe something, which means all Christians have doctrine. The New Testament is replete with stern warnings about pursuing sound doctrine, which means doctrine can be true or false.. Therefore the question is not whether or not we have theology and doctrine, but whether or not we have good theology, resulting in good doctrine, or whether we have we have bad theology, resulting in bad doctrine. Growth: How do you grow in Christian Faith and Life? In this day of instant coffee, instant pudding, instant replays and instant loans, some Christians want to skip the growth process. Do you have to have ‘daily devotions’ to be a good Christian? Are You Emotionally Mature? In this age, people have been programmed to act according to their feelings. Are you controlling your emotions? Do You Need Spiritual Exercise? sufficient spiritual nourishment does not come from sitting in church one hour per week. God’s Tests. Trust must be earned. Because God only promotes those whom He can trust, He will test us to see if we can be trusted. Forgiveness Does God expect us to forgive everyone who sins against us, even those who don't humble themselves, admit their sin, and request forgiveness? As we study Scripture closely, we discover that the answer is "No." To the surprise of many Christians, Scripture clearly states that, although we are commanded to love everyone, we are not required to forgive everyone. What is "Agape" and How Did It Work? We tend to assume at once that "love" means what it does to us in modern times -- in this case, a mushy sentimentality that never says a harsh word and never steps on the toes of others. But conceptually, it is certainly possible to love one's enemies, and yet also attack them. Entertainment and The Media In our world something has gone terribly wrong. Tv, Video Games, Movies, Fantasy Games and The Media are all a major part of the problem and possibly dangerous influences that can conform us to the world. But there are usually two or more sides to an issue. To either categorically declare all entertainment "evil" or accept all of them uncritically as "harmless" would both be simplistic and erroneous. How can a Christian make an intelligent assessment of these major influences, remembering that As Christians we are to live a pure lifestyle, even in private. To those who are troubled: the surest sign that you have not committed the blasphemy against the Holy Spirit is the very fact that you are worried about it, because that shows that the Holy Spirit is very definitely on speaking terms with you! The Will of God No other concern commands more interest or arouses more anxiety among Evangelicals than discovering the will of God. A spiritual gifts inventory that some have found helpful. These are limited to the ministry gifts and do not include the foundational gifts of apostleship or prophet, nor the sign gifts of tongues, interpretation of tongues, healings or miracles. It’s not hard to notice that the environmental issue receives very little attention in Christian circles. There are so many other significant issues that occupy our attention that we seem to think of the environment as somebody else's issue. Christians love to try and “change the world” However the Bible calls Christians to reach out first to their own family, than the family of believers, and then the outside world. The logic is plain enough to see: If you cannot manage the church, what on earth are you doing inserting yourself and your views outside the church? Corrosive Christianity (Salt of The Earth) Since Jesus told us that we were salt (not honey) it is a good idea to study the function of salt... and figure out exactly what salt does?